And Include A Guarantee Of Your Satisfaction! Note: DeskTop DragBasic is not compatible with Windows Vista. 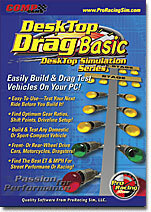 The DeskTop DragBasic from CompCams is an easy-to-use, 1/4-mile, drag-racing vehicle simulation for your PC. It combines low cost with powerful predictive accuracy. Test front- or rear-wheel drive automobiles, motorcycles, even dragsters. Use simple drop-down menus to select from a wide range of vehicle and driveline components or enter your own custom specifications. In seconds, the DragBasic will display ET, MPH, and comprehensive vehicle telemetry to within 7% of true track-test data. If you’ve ever asked the question: “What parts should I use for best performance?”, the DeskTop DragBasic simulation package is your key to finding the lowest ET, best acceleration, and highest top speed…before you spend a nickel on parts! Test gear ratios, vehicle weights, frontal areas, tire traction, launch and shift rpms, clutches, torque converters, engine power, even wind and weather conditions! Find out what works before you buy expensive parts! Save time. Save money. And have fun designing the “ultimate” street hot rod or all-out drag car. 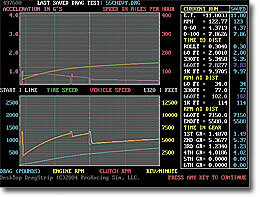 DeskTop DragBasic uses a comprehensive mathematical simulation to determine, inch-by-inch, vehicle performance throughout the 1/4-mile. Yet it is so easy to use, you’ll build and test your first vehicle in just minutes. Perform back-to-back tests and compare a virtually unlimited number of possible combinations. DeskTop DragBasic will help you find the best parts for your vehicle, fast! There is no other simulation software on the market that can compare with the DeskTop DragBasic in low cost and high accuracy. Get the most for your simulation dollar. Get the DeskTop DragBasic. Runs on any Windows-equipped PC. Test Driveline, Gear Ratios, Tires, Wheels, And More! Special Web Pricing & Package Deals Available Now! Build, Test, And Drag Race Domestic Or Sport Compact Vehicles On Your PC! Optimize Any Vehicle BEFORE You Build It; Save Thousands On Parts! Displays ET, MPH, Engine & Clutch (trans input shaft) RPM, Acceleration, Aero Drag, Tire Slip, and more! Improved Torque Converter Modeling, Bullet-Proof Shifting Algorithms, Improved Traction Analysis And Traction Calculator™. Model Virtually Any Vehicle, Weight, Frontal Area, Aero Drag, Wheelbase, Tires, Driving Style! Accurate, Easy-To-Use, State-Of-The-Art, And Fun!.